AFTER several delays and lots of confusion, the high security registration plate ( HSRP) finally debuted in the city on Monday. What about all the other states is it necessary for a vehicle entering the capital to have HSRP plates? Overall it is a good move and I would appreciate it more if govt forces this rule in all metros together including complete NCR region at least. Some one's making a killing. Just 2 centers for the entire city. How will they be able to cope with the demand? Another racket unleashed by short-sighted babus on millions of vehicle owners. Only to make millions. It's a bloody big racket involving top politicians and some bogus firms. On AP, re-tendering was done twice already and it is still in a limbo. All because some politician could not get the contact. It stinks. I am the process of acquiring the ratelist , Will be posting actual ratelist for the same soon. its ironic it took so long for delhi , north eastern states have it for years now. what is more ironic , the govt choose to implement the HSRP in states where the bulk of stolen cars go first rather than the states where the stealing actually happens. anyways a new excuse for the traffic policeman to challan you. HSRP would be available in total , 14 , Transport Offices after June 15. A month after the installation of high-security registration plates (HSRP) was made mandatory for all new vehicles registered in the national Capital, the transport department has decided to include old vehicles as well. Senior transport department officials said the company that had got the contract to install such plates in Delhi will start replacing registration plates of old vehicles from June 15. Since a large number of vehicles are registered in Delhi, the transport department and the company has come up with a plan to replace the old plates in vehicles in a phased manner. "In the first phase, we will replace registration plates in all DTC buses and vehicles belonging to the transport corporation. 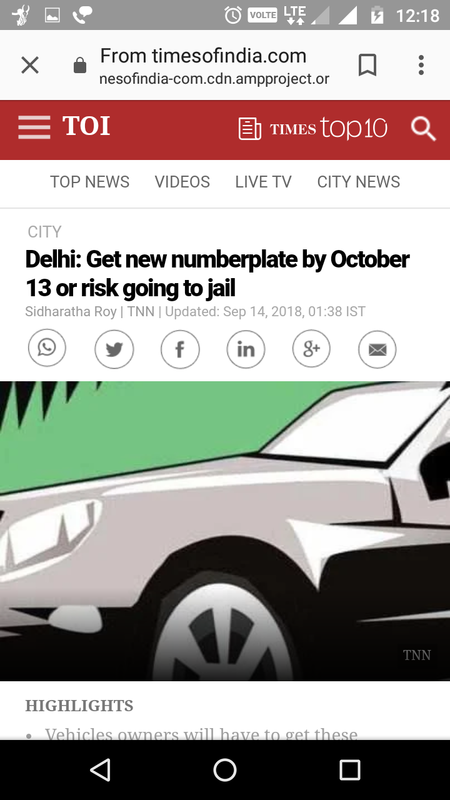 After that, we will start replacing plates of vehicles owned by Delhi government and its various departments," said a senior transport department official. In the third phase, the registration plates of vehicles belonging to the central government and its various departments will be replaced. The company will start replacing registration plates of private vehicles at the end, the official said. "We have already written to the DTC to gear up to get plates replaced in its buses and other vehicles," said an official. More than 70 lakh vehicles are registered in Delhi. On an average, 1,400 new vehicles hit Delhi roads every day. The company has been given two years to replace old registration plates of all vehicles in the Capital with the new high-security plates. "The plates of private vehicles will be replaced according to the year of registration. We are giving final touches to the plan. It will be made public in the next 23 days to ensure there is no confusion," the official said. Number plates will be installed in 11 centres across Delhi. All are located in close proximity of the transport authority office of that area. The company has one facility at Burari to manufacture plates. "The company will add one more facility at Mayapuri to enhance the production of plates," the official added. IT is a good move by government which is taking long time to implement this. However again we need to see here that what kind of alternatives will be found by the thieves of vehicles !! It is going to be a very big politicized project which involves corruption takes place. If you look at Andhra Pradesh, for the third time tenders were cancelled yesterday and all the deadlines given by High court is over and I think High court will prosecute CM of the state and related minister and other officials finally !! @Librankur thank you for sharing good information, my small suggestion is when you reply to others posts please have all the replies in one post rather than making some 10 replies separately. Can we have some photos which show what these plates are all about ? How do they get fixed on to the vehicles ? What will happen to the existing PVC/metal/sheet plates ? Some photos to highlight these aspects. Anyone got some photos ? We are yet to see them in AP. Today's papers are covering a news item to the effect that the latest round of tendering is also cancelled yesterday. Check at this URL and only then proceed to the venue. They wont penalise or impound vehicles . They will sieze one document RC or DL from the defaulter. From Nov 1, get cars with high- security plates. The onus now lies with the dealers now.Even after selling a vehicle ,they will have to keep it for 6-7 days to get the plates fixed. Another shocker for vehicles without HSRPs , To clear backlog,Transports Department asks Authorised service centres to not accept vehicles for service unless they have the HSRP.